Sometimes miracles take place right under our noses without us taking notice, but when we do, a sense of surprise seems overwhelming. 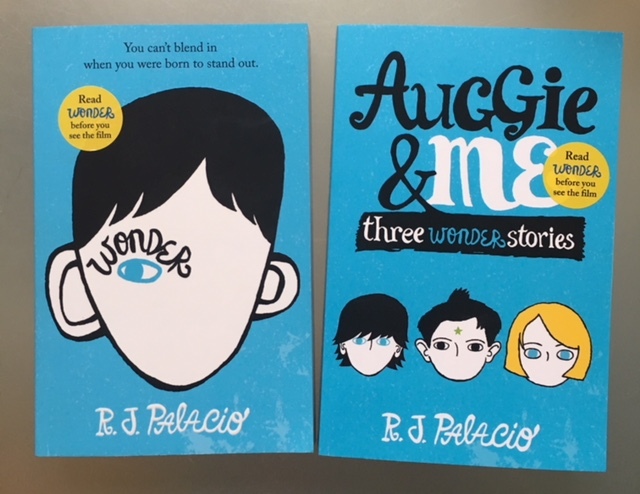 My son has been reading R. J. Palacio’s ‘Wonder’ this term at school, chosen by his wonderful English teacher, but as he reads a fair amount of books, I didn’t pay initial close attention to this particular book choice. He did mention it a few times, doing brief re-caps of what he was reading, but I still didn’t pick it up to leaf through the pages. Then we saw a trailer of ‘Wonder’ with Julia Roberts & something clicked in my head. A few days later I was reading Julia’s interview in UK’s Harper’s Bazaar, where she said that she came across ‘Wonder’ thanks to her own children. The effect snowballed. This past Sunday, instead of driving outside of London for a long country walk, kids and I went to the movies. Two hours flew by, I whellled up on several occasions, crying quietly as the movie finished, but what completed the circle for me & tugged at my heart, was my daughter saying ‘Mummy, I really enjoyed this movie’. ‘Wonder’ is a book written by an American author R.J. Palacio, tells a story of a boy whose lovely but disfigured face takes a back seat to the life changing beauty of his spirit and the effect he has on the people around him. At the time when we as society seem particularly fractured, this book makes you think about things that truly matter to us all, the unseen threads that tie us together, rather than pulling us apart. A story of love, resilience & strength that I am not going to recap here, as I don’t want to take away from you the pleasure of reading it, it resonated with me at the time I felt a little fragile myself. In part, the reason I found this story so endearing is because it reinforces the things that truly matter to most of us – family, love, children, resilience, illness, kindness, friendship & being in the school environment. Amazing headmasters (played by the wonderful Mandy Patinkin, who some of you might recognise as Saul from ‘Homeland’, who made me wish I had a headmaster like him in my time) that nurture our children’s spirit, celebrate their individuality and stand up for what they believe in, irrespective of how deep a parent’s pocket is. Teachers, like the one played by Daveed Diggs, who makes learning a fascinating journey & help shelter kids from the raging storms of unfairness. Children, who make an intuitive & at times difficult choice to be friends with a person who rings true, as opposed to being the most popular. Parents who struggle every day to do their best, sometimes focussing on one child, while deserting emotional needs of another. And those brave children & young adults, who through illness or disability might look different to us initially, yet their strength, wisdom, maturity and kindness are beyond their years and at times highlight the immaturity of adult behaviour. Don’t avert your eyes from them, don’t make them feel even more out of place or insecure than their already might be when you meet them – show them love & care that they might deserve & need in the moment in time way more than a regular child. Kids can be too cruel to others, who look different to their minds. Julia Roberts, you pulled at my heart strings, playing a mother who is so emotionally invested in her youngest child, that everything else becomes secondary, from her career to her relationship with the eldest daughter. You channel emotional fragility that every mother experiences & you don’t play that role – you live it, drawing, undoubtedly, from your own experience as a mother of three. Owen Wilson, bringing his own charm & relatable humour to the role of the dad, making me smile and think of my own husband, who loves our children to bits. Isabel Vidovic, playing Via, the sister who loves her brother unconditionally, yet struggles on her own teen journey, as her parents unintentionally desert her emotional needs, while fighting the corner of their youngest child, stumbling between surgeries, home schooling and watching their son emerge into the limelight of life in the mainstream school environment. Wonderful Noah Jupe, who plays Christopher and Millie Davis, who plays Summer, will make you smile because of the natural positivity that they radiate in every scene they appear in, as you observe their individual journey of maturity as human spirits. And the truly mesmerising Jacob Tremblay, who plays August, the main character & who does it in such a way, that you just want to rush forward and put your hands around him through the screen. This movie reminded me of my own favourite movie classics ‘Mrs Doubtfire’ and ‘Dead Poets Society’, which I hope ‘Wonder’ will become for the current generation of children and young adults, who are navigating their own tempestuous waters of life in the big sea. A must-see family movie that is memorable on so many levels, it’s really hard to put it into words. A film that I will undoubtedly watch again and again once it comes out on the DVD, but of course I will have to read the book before that! Life is a journey, treacherous and painful at times, but hopefully we are brave enough to step up and make a difference to those who might look different, yet are a no less important to the fabric of society than we are. As August says himself in the closing movie scene ‘Noone is ordinary and we all deserve a standing ovation at least once in our lifetime’. Let’s never forget what a kind gesture or a genuine smile can do to a person, whose soul is already in turmoil because they supposedly don’t fit the criteria of ‘normal’ or ‘ordinary’. Personally, I am so grateful that my son is taught by the teachers who select books like ‘Wonder’ for him & his classmates to read & discuss together in class & who put books like that in my own line of vision. And for the learning curve that both the book & the movie encourage you to experience through your own discussion around the family table. The movie ‘Wonder’ is based on R.J Palacio book ‘Wonder’. There is also a separate book, ‘Auggie & Me: Three Wonder stories’ that give story’s perspective from the point of view of bully Julian, oldest friend Christopher & classmate Charlotte. Part of me doesn’t want to see the film as I had my own picture in my head of the characters. So wonderful that this brilliant book is being rediscovered though! I have a very soft spot for it. I first choose it for a book club I was part of about 5 years ago at around the same time I had started a business which is coincidentally the same name. So many life lessons for all ages. I know how you feel, as often movies don’t live up to the book that we loved reading to start with. In my case, I watched the movie without reading a book, but will try to distinguish between the too as I dive into reading. Thank you for sharing your thoughts on the book and a wonderful snippet on how the name of your blog came together!